Excellent experience, I would recommend this property. We will be re-booking again in December and January. Everything! Washer/dryer, view, dishwasher, ,2 bathrooms, large fridge, super location, excellent staff, just everything!! The location, super close to the train station. And that rooms very big and confortable. great location, and good value for money. This is the third time we have stayed here and we would recommend it to others. The only small thing I would bring up is the showers, while they are good, they seem to be set at one temperature. Hot, but if like me you like a cold blast at the end its not ideal. Staff was warm and welcoming, the apartment had plenty of space and amenities, the location was very close to a happening area in town, we had free parking and everything went off without a hitch. The accommodation was in an ideal location, not far from the Titanic exhibition. The beds were comfortable. 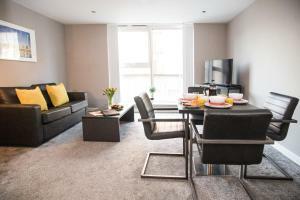 Lock in a great price for Dream Apartments Belfast – rated 8.7 by recent guests! Dream Apartments Belfast This rating is a reflection of how the property compares to the industry standard when it comes to price, facilities and services available. It's based on a self-evaluation by the property. Use this rating to help choose your stay! 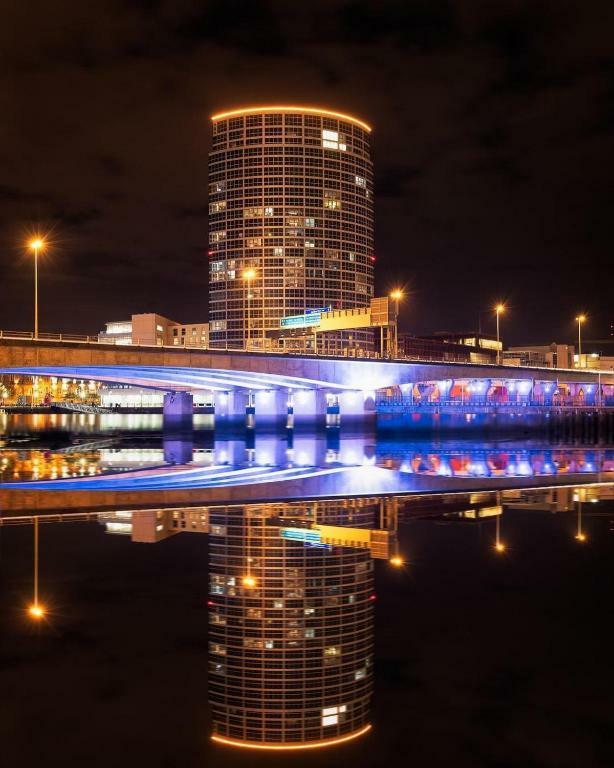 One of our top picks in Belfast.Dream Apartments Belfast is located in both the Obel Tower and the building adjacent to the Obel Tower, offering high-quality accommodations in Belfast’s waterfront district. Within 10 minutes’ walk of the city center and the Odyssey Arena, these apartments have free WiFi and a 24-hour concierge service. 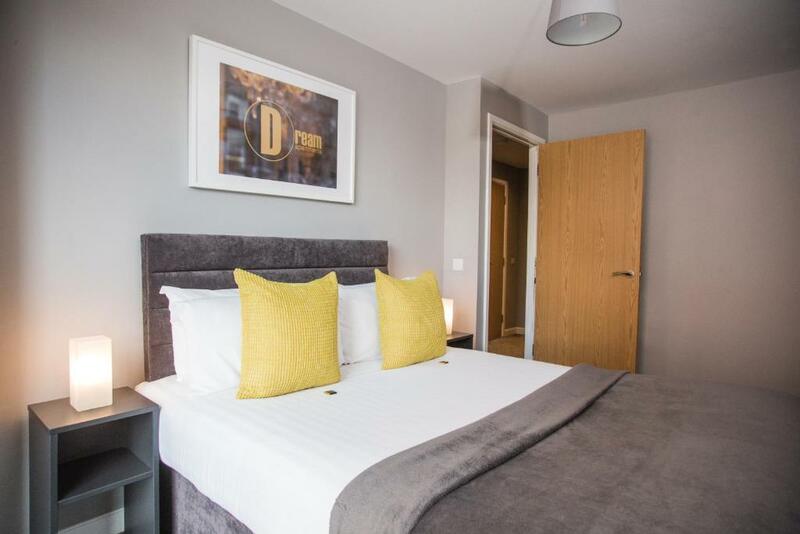 Dream Apartments Belfast offer easy access to Belfast's high street and are around 15 minutes’ walk from the Titanic Quarter and 10 minutes from the Belfast Waterfront arts and entertainment venue. Belfast City Hall and the Grand Opera House are among the city center attractions within 15-20 minutes’ walk. 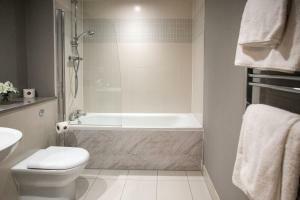 When would you like to stay at Dream Apartments Belfast? This one-bedroom apartment offers open-plan design. There's a double bedroom and a bathroom, as well as a living area and a modern, well-equipped kitchen. There's a cleaning service and 24-hour concierge. 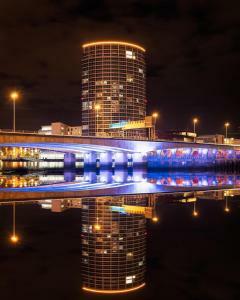 One Bedroom Apartments are in the adjoining building to the Obel Tower. These units don't have city views. 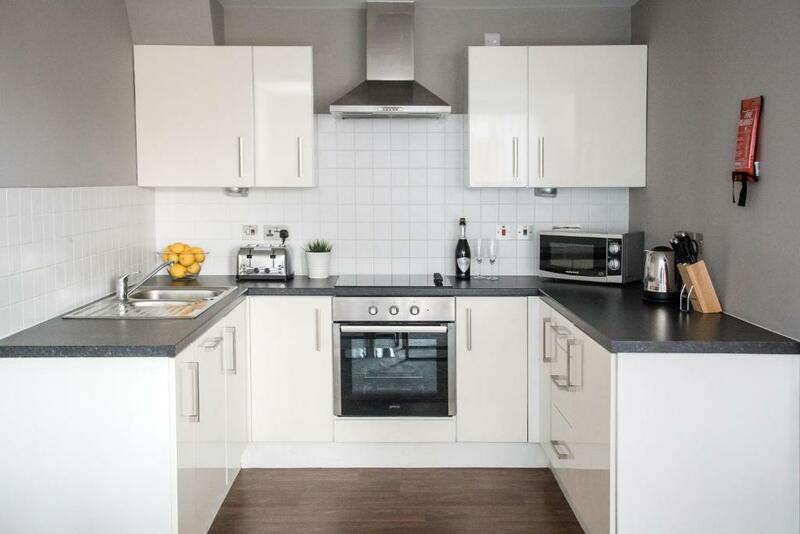 This apartment features a toaster, kitchen and washing machine. 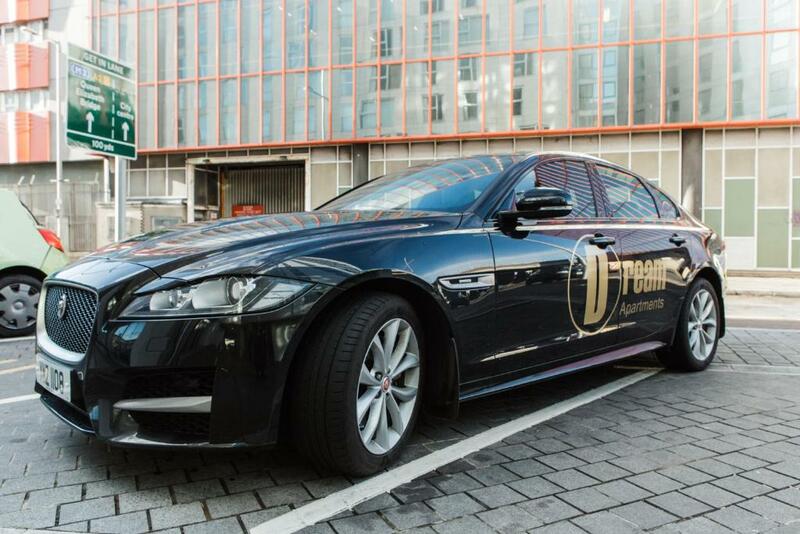 Here at Dream Apartments we offer guests a home away from home, whether your trip is for business or leisure. Our friendly and helpful staff can assist you with anything you need to explore your new city, from short city breaks to long-term relocation solutions. Dream Apartments, founded in 2017, now operates over 300 serviced apartments in three major cities across the UK as well as internationally in Paris, Barcelona and Amsterdam. ASAP accredited so you can stay with confidence. Winner of World Serviced Apartment Award for 2017 & 2018. Enjoy all the amenities of a hotel with the additional space of a serviced apartment. Stay with confidence when you stay at Dream Apartments. House Rules Dream Apartments Belfast takes special requests – add in the next step! Dream Apartments Belfast accepts these cards and reserves the right to temporarily hold an amount prior to arrival. Please note that Dream Apartments Belfast reserve the right to request a deposit of at least GBP 250 before or upon arrival. When booking for 4 people or more, different policies and additional supplements will apply. The property has a strict nonparty policy should the maximum number of people per apartment be exceeded without authorization, guests will be charged. Please note that stag, hen and other parties are not permitted. Guests must be aged 21 or over, or accompanied by a parent/guardian. Car parking is charged at GBP 15 per day. The credit or debit card used for booking must be presented upon arrival. Guests must also provide a passport or other photographic identification matching the name of the customer or the name on the card. Photographic identification will also be requested from all accompanying guests. No arrivals are accepted prior to 14:00. If you expect to arrive after 20.00, please inform the property in advance. Contact details can be found on the booking confirmation. Reception hours are from 08.00 until 20.00, however concierge is available 24 hours a day. A damage deposit of GBP 250 is required on arrival. That's about 325.24USD. This will be collected by credit card. You should be reimbursed on check-out. Your deposit will be refunded in full by credit card, subject to an inspection of the property. Hot water system meant that there was no hot water when we arrived. We had to push a button and wait hours before the kids could shower. The dishwasher didn’t work and there was no tea towel available. Small thing but a salad bowl would have been useful in the kitchen. Efficient friendly service, great apartment,excellent location,good value. Convenient location. Roomy and comfortable, good value. There was a slight hiccup in checking in to collect the key, as the address on my confirmation email gave 62 Obel Towers and the reception and apartment I was booked into was actually at 64 Obel Towers. However, a quick phone call rectified the matter. Excellent apartment with river view in great location. Ovation, Marconi's restaurant with excellent chef. Can recommend the Rathlin scallops! We could have done with directions to the property from the ferry terminal as it was difficult to get to (even with sat nav). The only downside was the parking - having to go to reception each time to get in and out - signage was very poor so not at all sure where to go when first arriving. Location was great (when we finally found it). A lovely spacious apartment with all facilities in working order. The shower was great with plenty of hot water. Reception staff were very friendly and helpful. Only a two seater setter - would have been nice to have had a three seater and/or one armchair. Spacious apartment. Comfortable beds. Pleasant view. Very pleasant & helpful receptionist (Lindsey). There is a deposit taken from your card incase of breakages of £236 which will be put back into your card within 3 days which should be put in on the day you leave. check the apartment when you arrive and take photos of anything broken there were some things damaged which I brought to the attention of the reception staff coffee table and a press coffee table was dangerous as it was glass one of the legs was broken and balancing on the frame someone was supposed to come and take it away but they didn't. Location wise excellent and quiet warm pleasant apartment nice views of Belfast. Great city lovely people.